If you own a luxury watch with a tachymeter, first, congratulate yourself for your good taste. Second, congratulate yourself that you even knew how to look up “tachymeter”, spell & pronounce it. We’d forgive you for buying a luxury watch and completely ignoring the technical dials around the edges. They look good. The occasional where you might need to actually use this dial is limited. But, if you have started wondering what the dial is and how to use it then great timing. You better figure this one out before someone asks, that would be embarrassing. You don’t need to have too much of a maths brain to figure it out either. It’s not as complicated as it appears. A tachymeter is a scale for speed. Speed is the time it takes for something to get from point A to point B. So, speed is a measure of distance & time and the tachymeter helps you to work out the speed by the hour. If you thought you needed more of a maths brain to use a tachymeter, you might be surprised to hear you need less of a maths brain. Because it works everything out for you, that’s kind of the point. Imagine you have taken your girlfriend to a rowing competition. You want to impress her with your excellent knowledge of rowing, your maths brain & the fact you have an expensive watch on your wrist. Use the Tachymeter to measure the speed of the rowing boat from the start to finish line. The first thing you need to be aware of is the scale of your Tachymeter. On a Speedmaster the scale runs from 7.2 seconds up to 60, so you need to measure within this scale. Second thing, you need to know the distance you are measuring, it makes it a lot easier if this distance is a whole number like 10 meters, 100 meters, 1 mile, 1klm. You’ll notice that the units changed there, that doesn’t matter. What matters is that you are measuring the point between A & B, you know the distance & the time you measure is within the range you have on your Tachymeter, for Speedmasters its 7.5 to 60 seconds. Let’s say at the rowing competition the first 100 meters has been marked out. When the gun goes start your tachymeter & keep it running until the boat hits the 100 meter mark. Stop it. Then read the dial around the edge of your watch at the point your hand is indicating. Say it took the boat 10 seconds to reach the 100 meter mark, your second hand will be pointing at 450. There is one more thing you need to do work out the km/hour from here. You need to divide 450 by 10, because 1klm is 10 X 100 meters. This makes 45. So now you know that this boat is travelling at 45KLM/hour. The same rules apply to any situation you want to measure the speed. Have a go and your maths brain will quickly come into focus. If it doesn’t, at least you’ll be able to answer the question “what are those dials around the edge for”, you can say, “to measure speed my friend” & smile. Hopefully they won’t question you further. 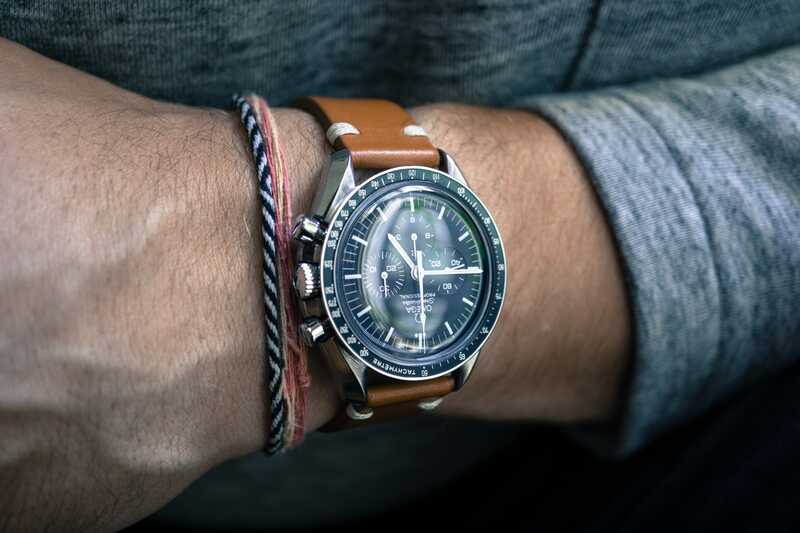 We hope you enjoyed this post, for more great content on luxury watches check out the related posts below or visit our shop where you can find thousands of pre-owned watches. We pride ourselves on making your experience with us 5* & enjoy helping customers choose the best watch for them. But don’t just take our word for it, check out the reviews our customers have left us. What is a Self Winding Watch?